Every year, more than 2 million Americans find out they have skin cancer. At a time when most other cancer rates are in retreat, the rate of newly diagnosed cases of melanoma — the most deadly skin cancer — has tripled since the 1970s. Though there’s no single or definitive answer, most experts attribute many of these new cases to widespread overexposure to sun. For bad sun safety habits, much blame falls on poor-quality sunscreens and misleading sunscreen advertising that leads people to believe, wrongly, that their products protect their skin from too much sun. For busy shoppers faced with a sea of beautifully-packaged bottles and tubes, the trick is figuring out which sunscreen represents the best value – and will get used by the whole family. EWG’s 2014 Guide to Sunscreens is designed to empower consumers with a user-friendly searchable database that puts them in charge. Over the past eight years, as EWG has investigated the performance of American sunscreens, we’ve seen surprisingly few improvements in the safety and effectiveness of sunscreens sold by mass-marketed brands. Yet because of increasing consumer awareness and innovation by small companies, Americans have more good choices. More zinc- and titanium-based mineral sunscreens are on the market, and that’s a good thing, because they do not penetrate the skin and offer stable and lasting UV protection. One-third of the beach and sport sunscreens we have assessed for the current summer season offer good skin protection and are free of ingredients with serious safety concerns. That means two-thirds of the sunscreens in the EWG analysis don’t work well enough or contain ingredients that may be toxic. American stores are still stocked with inferior products. See more of this article by EWG below or by clicking here. Regulations enforced by the federal Food and Drug Administration are feeble, tardy and full of gaps. The FDA’s first major set of sunscreen regulations, 36 years in the making, took effect in December 2012 and proved far too weak to transform the market. They restricted some of the most egregious claims on sunscreen labels, among them, the patently false “waterproof” and “sweatproof. ” As well, the FDA ended the sale of powder sunscreens and towelettes — products too thin to protect skin from ultraviolet rays. Moreover, powders with zinc oxide and titanium dioxide nanoparticles posed a serious inhalation hazard. But the FDA’s task is only beginning. The agency wants to set an upper limit on sunscreen SPF claims, but that proposed regulation is winding slowly through the tortuous regulatory thicket. It is considering banning spray sunscreens on grounds they are ineffective and could cause lung damage. And it is under pressure from Congress, advocates and manufacturers to approve some European sunscreen ingredients. Until the agency accelerates its efforts to ensure the long-term safety and effectiveness of sunscreen ingredients, Americans will not have access to the best possible products. Broad spectrum protection – Almost every American-marketed sunscreen with an SPF of 15 or higher meets the FDA’s rules for “broad spectrum protection,” meaning that it can claim to protect skin against both ultraviolet A and B rays. The catch is, the FDA has set a low bar. According to our modeling of sunscreen ingredients and their effectiveness, EWG estimates that half of the U.S. sunscreens that meet the FDA rules would not make it to store shelves in Europe, where, since 2006, sunscreen makers have voluntarily complied with stricter European Union standards (European Commission 2006). European ingredients – The most common UVA filter in American sunscreens is a chemical called avobenzone, approved by the FDA in 1972. The agency has not approved a new sunscreen chemical since 1999. Beginning in 2003, U.S. sunscreen companies petitioned the FDA for approval to formulate their products with eight chemicals used as UV filters in Europe and elsewhere. The agency has failed to act on petitions for six of these ingredients, including four that appear to offer stronger UVA protection than avobenzone or other UVA screens now permitted by FDA. These chemicals – Mexoryl SX, Mexoryl XL, Tinosorb S and Tinosorb M — could improve the effectiveness of U.S. sunscreens if approved. The FDA has been so slow in investigating promising sunscreen ingredients that Sen. John Reed (D-Rhode Island) has introduced the “Sunscreen Innovation Act” to spur it to take action. High SPF – Sky-high SPF numbers are no measure of sunscreen effectiveness. A sunscreen’s sun protection factor, or SPF, measures its ability to deflect skin burning UV rays, primarily UVB rays. The SPF value does not reflect the product’s ability to filter out UVA rays that, according to a growing body of evidence, cause skin damage, immune suppression and possibly melanoma. Studies show that people who use high-SPF products are exposed to as many or more ultraviolet rays than those who use lower-SPF products. Many experts believe that people get a false sense of security from those big numbers, don’t apply enough sunscreen, wait too long before reapplying and spend too much time in bright sun. Fully 15 percent of beach and sport sunscreens on the market this year are labeled with SPF values greater than 50+. The FDA has proposed to limit SPF claims to 50+ but has not issued a legally binding regulation to that end. By contrast, the European Commission rule caps SPF claims at 50+. 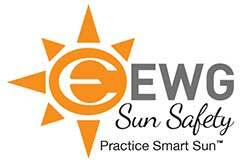 Sprays and powders – One in three sunscreens in EWG’s database for this year is a spray. In 2011 FDA said it lacked data to confirm that spray products are safe and effective. It asked manufacturers to provide proof that sprays form a layer of sunscreen thick enough to protect skin and to show that sprays don’t pose inhalation risks. If the agency does not receive sufficient data to substantiate these products’ safety, the FDA can bar them. But until the agency takes decisive action, sprays remain on store shelves, and many shoppers buy them for ease of application. The FDA has issued a rule barring sunscreen and makeups in loose powder form from claiming SPF protection. But several powders are still on the market. These contain zinc or titanium nanoparticles that should not be inhaled. Powders also have a practical drawback; users cannot tell if they are applying a thick, even coating essential for UV protection. Vitamin A, also known as retinyl palmitate and retinol –This ingredient is in about 20 percent of the beach and sport sunscreens and 12 percent of SPF moisturizers in this year’s database. It is used in regular makeup as an anti-aging ingredient. It has been shown to hasten the development of skin tumors and lesions on sun-exposed skin. Data on the potential skin cancer risk of retinyl palmitate have been public since 2010, but most sunscreen makers have not abandoned this chemical as they should. EWG recommends against using sunscreen and cosmetics whose labels disclose the presence of vitamin A, retinyl palmitate or retinol until this chemical’s safety on sun-exposed skin is proven. Oxybenzone – This common chemical sunscreen filter shows up in nearly half of the beach and sport sunscreens in EWG’s database this year. It has several disadvantages: it soaks through skin, triggers allergic skin reactions in sensitive individuals and may disrupt the hormone system (Krause 2012). Despite evidence that oxybenzone is a hormone disruptor, the FDA has not yet investigated it rigorously. The agency should give oxybenzone top priority because it has been detected in urine and breast milk samples and could affect the development of the fetus and the health of children and adults (Schlumpf 2010, Calafat 2008). Moisturizers with SPF – Daily-use moisturizers with SPF claims should offer lasting protection from both UVA rays and UVB rays. UVA rays are especially insidious because they bombard us year round, in contrast to UVB rays, which are more intense in the summer. Most moisturizers with SFP don’t fill the bill. This year EWG examined the product labels of 246 moisturizers with SPF and found that only one in four offered strong and lasting sun protection. This is a critical shortcoming, because moisturizers are generally designed to be applied just once a day. EWG did not evaluate make-up and lip products with SPF claims this year. In prior years we have found that SPF-rated makeup and lip products do not offer significant protection from the sun. * Statistics in this report are based on products in the EWG database as of May 2014.